Hillary Diane Rodham Clinton (born October 26, 1947) is the junior United States Senator from New York, and a current candidate for the Democratic nomination in the 2008 presidential election. She is married to Bill Clinton—the 42nd President of the United States—and was the First Lady of the United States from 1993 to 2001. A native of Illinois, Hillary Rodham attracted national attention in 1969 for her remarks as the first student to deliver the commencement address at Wellesley College. She began her career as a lawyer after graduating from Yale Law School in 1973. Following a stint as a Congressional legal counsel, she moved to Arkansas in 1974 and married Bill Clinton in 1975. She was later named the first female partner at Rose Law Firm in 1979 and was listed as one of the one hundred most influential lawyers in America in 1988 and 1991. She was the First Lady of Arkansas from 1979 to 1981 and 1983 to 1992 and was active in a number of organizations concerned with the welfare of children as well as sitting on the board of Wal-Mart and several other corporate boards. As First Lady of the United States, her major initiative, the Clinton health care plan, failed to gain approval by the U.S. Congress in 1994. 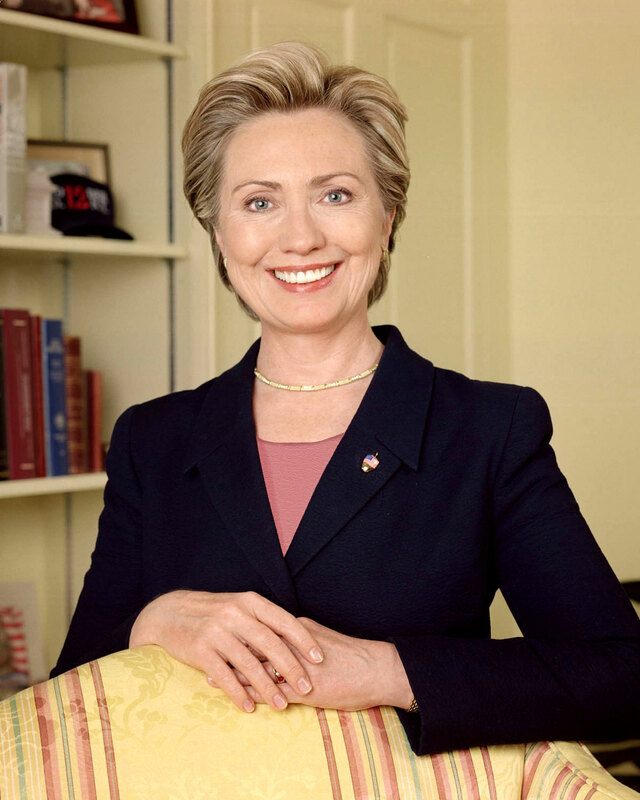 In 1997 and 1999, Clinton played a role in advocating for the establishment of the State Children’s Health Insurance Program, the Adoption and Safe Families Act, and the Foster Care Independence Act. She became the only First Lady to be subpoenaed, testifying before a federal grand jury as a consequence of the Whitewater controversy in 1996. She was never charged with any wrongdoing in this or several other investigations during her husband’s administration. The state of her marriage to Bill Clinton was the subject of considerable public discussion following the Lewinsky scandal in 1998. After moving to New York, Clinton was elected as senator for New York State in 2000. That election marked the first time an American First Lady ran for public office; Clinton is also the first female senator to represent New York. In the Senate, she initially supported the George W. Bush administration on some foreign policy issues, which included voting for the Iraq War Resolution. She has subsequently opposed the administration on its conduct of the Iraq War and has opposed it on most domestic issues. She was re-elected by a wide margin in 2006. In the 2008 presidential nomination race, Clinton has won the most primaries and delegates of any woman in U.S. history. Hillary Diane Rodham was born at Edgewater Hospital in Chicago, Illinois, and was raised in a United Methodist family, first in Chicago, and then, from the age of three, in suburban Park Ridge, Illinois, which is also located in Cook County. Her father, Hugh Ellsworth Rodham, was a child of Welsh and English immigrants and operated a successful small business in the textile industry. Her mother, Dorothy Emma Howell, of English, Scottish, French Canadian, and Welsh descent, was a homemaker. She has two younger brothers, Hugh and Tony. As a child, Hillary Rodham was involved in many activities at church and at her public school in Park Ridge. She participated in tennis and other sports and earned awards as a Brownie and Girl Scout. She attended Maine East High School, where she participated in student council, the debating team and the National Honor Society. For her senior year she was redistricted to Maine South High School, where she was a National Merit Finalist and graduated in 1965. Her parents encouraged her to pursue the career of her choice. Raised in a politically conservative household, at age thirteen she helped canvass South Side Chicago following the very close 1960 U.S. presidential election, finding evidence of electoral fraud against Republican candidate Richard Nixon, and volunteered for Republican candidate Barry Goldwater in the U.S. presidential election of 1964. Her early political development was shaped most strongly by her energizing high school history teacher, who got her to read Goldwater’s classic The Conscience of a Conservative and who was, like her father, a fervent anti-communist, and by her Methodist youth minister, like her mother concerned with issues of social justice; with the minister she saw and met civil rights leader Martin Luther King, Jr. in Chicago in 1962. In 1965, Rodham enrolled in Wellesley College, where she majored in political science. She served as president of the Rockefeller Republican-oriented Wellesley Young Republicans organization during her freshman year and with them supported the elections of John Lindsay and Edward Brooke. However, due to her evolving views regarding the American Civil Rights Movement and the Vietnam War, she stepped down; she characterized her nature as that of “a mind conservative and a heart liberal.” Active in campus affairs, she sought to work for change within the system, rather than take then-popular radical actions against it. In her junior year, Rodham was greatly affected by the death of Martin Luther King, Jr., and became a supporter of the anti-war presidential nomination campaign of Democrat Eugene McCarthy. Rodham organized a two-day student strike and worked with Wellesley’s black students for moderate changes, such as recruiting more black students and faculty. In early 1968, she was elected president of the Wellesley College Government Association and served through early 1969; she was instrumental in keeping Wellesley from being embroiled by the student disruptions common to other colleges. A number of her fellow students thought she might someday become the first woman President of the United States. She attended the “Wellesley in Washington” summer program at the urging of Professor Alan Schechter, who assigned Rodham to intern at the House Republican Conference so she could better understand her changing political views. Rodham was invited by moderate New York Republican Representative Charles Goodell, to help Governor Nelson Rockefeller’s late-entry campaign for the Republican nomination. Rodham attended the 1968 Republican National Convention in Miami. However, she was upset by how Richard Nixon’s campaign portrayed Rockefeller and what she perceived as the “veiled” racist messages of the convention, causing her to leave the Republican Party for good. Rodham returned to Wellesley, and wrote her senior thesis about the tactics of radical community organizer Saul Alinsky under Professor Schechter (which, years later while she was First Lady, was suppressed at White House request and became the subject of speculation). In 1969, Rodham graduated with a Bachelor of Arts, with departmental honors in political science. Stemming from the demands of some students, she became the first student in Wellesley College history to deliver their commencement address. Her speech received a standing ovation lasting seven minutes. She was featured in an article published in Life magazine, due to the response to a part of her speech that criticized Senator Edward Brooke, who had spoken before her at the commencement. She also appeared on Irv Kupcinet’s nationally-syndicated television talk show as well as in Illinois and New England newspapers. That summer, she worked her way across Alaska, washing dishes in Mount McKinley National Park and sliming salmon in a fish processing cannery in Valdez (which fired her and shut down overnight when she complained about unhealthy conditions). Rodham then entered Yale Law School, where she served on the Board of Editors of the Yale Review of Law and Social Action. During her second year, she worked at the Yale Child Study Center, learning about new research on early childhood brain development and working as a research assistant on the seminal work, Beyond the Best Interests of the Child (1973). She also took on cases of child abuse at Yale-New Haven Hospital, and volunteered at New Haven Legal Services to provide free advice for the poor. In the summer of 1970, she was awarded a grant to work at Marian Wright Edelman’s Washington Research Project, where she was assigned to Senator Walter Mondale’s Subcommittee on Migratory Labor, researching migrant workers‘ problems in housing, sanitation, health and education; Edelman later became a significant mentor. In the late spring of 1971, she began dating Bill Clinton, also a law student at Yale. That summer, she interned on child custody cases at the Oakland, California, law firm of Treuhaft, Walker and Burnstein, which was well-known for its support of constitutional rights, civil liberties, and radical causes; two of its four partners were current or former communist party members. Clinton canceled his original summer plans in order to live with her in an apartment in Berkeley, California, later writing, “I told her I’d have the rest of my life for my work and my ambition, but I loved her and I wanted to see if it could work out for us.” The couple continued living together in New Haven when they returned to law school. The following summer, Rodham and Clinton campaigned in Texas for unsuccessful 1972 Democratic presidential candidate George McGovern. She received a Juris Doctor degree from Yale in 1973, having spent an extra year in order to be with Clinton. Clinton first proposed marriage to her following graduation, but she declined. She began a year of post-graduate study on children and medicine at the Yale Child Study Center. Her first scholarly article, “Children Under the Law”, was published in the Harvard Educational Review in late 1973. Discussing the new children’s rights movement, it stated that “child citizens” were “powerless individuals” and argued that children should not be considered equally incompetent from birth to attaining legal age, but rather courts should presume competence except when there is evidence otherwise, on a case-by-case basis. The article became frequently cited in the field. During her post-graduate study, Rodham served as staff attorney for Edelman’s newly founded Children’s Defense Fund in Cambridge, Massachusetts, and as a consultant to the Carnegie Council on Children. During 1974 she was a member of the impeachment inquiry staff in Washington, D.C., advising the House Committee on the Judiciary during the Watergate scandal. Under the guidance of Chief Counsel John Doar and senior member Bernard Nussbaum, Rodham helped research procedures of impeachment and the historical grounds and standards for impeachment. The committee’s work culminated in the resignation of President Richard Nixon in August 1974. By then, Rodham was viewed as someone with a bright political future; Democratic political organizer and consultant Betsey Wright had moved from Texas to Washington the previous year to help guide her career; Wright thought Rodham had the potential to one day become a senator or president. Meanwhile, Clinton had repeatedly asked her to marry him, and she had continued to demur. However, after failing the District of Columbia bar exam and passing the Arkansas exam, Rodham came to a key decision. As she later wrote, “I chose to follow my heart instead of my head.” She thus followed Bill Clinton to Arkansas, rather than staying in Washington where career prospects were best. Clinton was at the time teaching law and running for a seat in the U.S. House of Representatives in his home state. In August 1974, she moved to Fayetteville, Arkansas, and became one of two female faculty members in the School of Law at the University of Arkansas, Fayetteville, where Bill Clinton also taught. She still harbored doubts about marriage, concerned that her separate identity would be lost and her accomplishments would be viewed in the light of someone else’s accomplishments. The couple bought a house in Fayetteville in the summer of 1975, and she finally agreed to marry him. Hillary Rodham and Bill Clinton were married on October 11, 1975, in a Methodist ceremony in their living room. She kept her name as Hillary Rodham, later writing that she had done so to keep their professional lives separate and avoid seeming conflicts of interest, although it upset both their mothers. Bill Clinton had lost the Congressional race in 1974, but in November 1976 was elected Arkansas Attorney General. This required the couple to move to the state capital of Little Rock. Rodham joined the venerable Rose Law Firm, a bastion of Arkansan political and economic influence, in February 1977, specializing in patent infringement and intellectual property law, while also working pro bono in child advocacy; she rarely performed litigation work in court. Rodham maintained her interest in children’s law and family policy, publishing the scholarly articles “Children’s Policies: Abandonment and Neglect” in 1977 and “Children’s Rights: A Legal Perspective” in 1979. The latter continued her argument that legal competence of children depended upon their age and other circumstances, and that in cases of serious medical rights judicial intervention is sometimes warranted. An American Bar Association chair later said, “Her articles were important, not because they were radically new but because they helped formulate something that had been inchoate.” Historian Garry Wills would later term her “one of the more important scholar-activists of the last two decades”, while conservatives said her theories would usurp traditional parental authority, allow children to file frivolous lawsuits against their parents, and considered her work part of legal “crit” theory run amok. Rodham co-founded the Arkansas Advocates for Children and Families, a state-level alliance with the Children’s Defense Fund, in 1977. In late 1977, President Jimmy Carter (for whom Rodham had done 1976 campaign coordination work in Indiana) appointed her to the board of directors of the Legal Services Corporation, and she served in that capacity from 1978 until the end of 1981. From mid-1978 to mid-1980 she served as the chair of that board, the first woman to do so. During her time as chair, funding for the Corporation was expanded from $90 million to $300 million; subsequently she successfully battled against President Ronald Reagan’s initial attempts to reduce the funding and change the nature of the organization. Following the November 1978 election of her husband as Governor of Arkansas, Rodham became First Lady of Arkansas in January 1979, her title for a total of twelve years (1979–1981, 1983–1992). Clinton appointed her chair of the Rural Health Advisory Committee the same year, where she successfully obtained federal funds to expand medical facilities in Arkansas’ poorest areas without affecting doctors’ fees. In 1979, she became the first woman to be made a full partner of Rose Law Firm. From 1978 until they entered the White House, she had a higher salary than her husband. During 1978 and 1979, while looking to supplement their income, Rodham made a spectacular profit from trading cattle futures contracts; her initial $1,000 investment generated nearly $100,000 when she stopped trading after ten months. The couple also began their ill-fated investment in the Whitewater Development Corporation real estate venture with Jim and Susan McDougal at this time. On February 27, 1980, Rodham gave birth to a daughter, Chelsea, her only child. In November 1980, Bill Clinton was defeated in his bid for re-election. Bill Clinton returned to the Governor’s office two years later by winning the election of 1982. During her husband’s campaign, Rodham began to use the name Hillary Clinton, or sometimes “Mrs. Bill Clinton”, in order to have greater appeal to Arkansas voters; she also took a leave of absence from Rose Law in order to campaign for him full-time. As First Lady of Arkansas, Hillary Clinton chaired the Arkansas Educational Standards Committee from 1982 to 1992, where she sought to bring about reform in the state’s court-sanctioned public education system. In one of the most important initiatives of the entire Clinton governorship, she fought a prolonged but ultimately successful battle against the Arkansas Education Association to put mandatory teacher testing as well as state standards for curriculum and classroom size in place. She introduced Arkansas’ Home Instruction Program for Preschool Youth in 1985, a program that helps parents work with their children in preschool preparedness and literacy. She was named Arkansas Woman of the Year in 1983 and Arkansas Mother of the Year in 1984. Clinton continued to practice law with the Rose Law Firm while she was First Lady of Arkansas. She earned less than all the other partners, due to fewer hours being billed, but still made more than $200,000 in her final year there. She continued to rarely do trial work, but was considered a “rainmaker” at the firm for bringing in clients, partly due to the prestige she lent the firm and to her corporate board connections. She was also very influential in the appointment of state judges. Bill Clinton’s Republican opponent in his 1986 gubernatorial re-election campaign accused the Clintons of conflict of interest, because Rose Law did state business; the Clintons deflected the charge by saying that state fees were walled off by the firm before her profits were calculated. From 1987 to 1991 she chaired the American Bar Association’s Commission on Women in the Profession, which addressed gender bias in the law profession and induced the association to adopt measures to combat it. She was twice named by the National Law Journal as one of the 100 most influential lawyers in America, in 1988 and in 1991. When Bill Clinton thought about not running again for governor in 1990, Hillary Clinton considered running herself, but private polls were unfavorable and in the end he ran and was re-elected for the final time. Clinton served on the boards of the Arkansas Children’s Hospital Legal Services (1988–1992) and the Children’s Defense Fund (as chair, 1986–1992). In addition to her positions with non-profit organizations, she also held positions on the corporate board of directors of TCBY (1985–1992), Wal-Mart Stores (1986–1992) and Lafarge (1990–1992). TCBY and Wal-Mart were Arkansas-based companies that were also clients of Rose Law. Clinton was the first female member on Wal-Mart’s board, added when chairman Sam Walton was pressured to name one; once there, she pushed successfully for the chain to adopt more environmentally-friendly practices, pushed largely unsuccessfully for more women to be added to the company’s management, and was silent about the company’s famously anti-labor union practices. After her husband became a candidate for the Democratic presidential nomination of 1992, Hillary Clinton received popular national attention for the first time. Before the New Hampshire primary, tabloid publications printed claims that Bill Clinton had had an extramarital affair with Gennifer Flowers, an Arkansas lounge singer. In response, the Clintons appeared together on 60 Minutes, during which Bill Clinton denied the affair but acknowledged he had caused “pain” in their marriage. (Years later, he would admit that the Flowers affair had happened, but to a lesser extent than she had claimed.) The joint appearance was credited with rescuing his campaign. During the campaign, Hillary Clinton made culturally dismissive remarks about Tammy Wynette and her outlook on marriage, and about women staying home and baking cookies and having teas, that were ill-considered by her own admission. Bill Clinton said that electing him would get “two for the price of one” or “buy one, get one free”, referring to the prominent role his wife would assume. Beginning with Daniel Wattenberg’s August 1992 The American Spectator article “The Lady Macbeth of Little Rock”, Hillary Clinton’s own past ideological and ethical record came under conservative attack.